Torre Pedrera is the northernmost resort of Rimini's Riviera and is situated 7 kilometres far from its old town (it is easily accessible through regular buses no. 4, which depart from the railway station in the direction of Bellaria and reach Torre Pedrera in 20 minutes, or by taxi). Torre Pedrera di Rimini is named after the ancient tower which was commissioned by the Pope in 1673. Erected at the mouth of the dry river where local inhabitants discovered the sandstone they later employed for the building of their houses, this small hamlet was called "Torre della Pedriera". Since its foundation, "Torre Pedrera" has played a fundamental role in the supervision of maritime activities, such as fishing, protection against Saracen attacks and Turkish invasions and the control of goods which came from Ravenna and Venice. Torre Pedrera achieved utmost popularity and in 1842 it was included in the nautical charts as one of the most important centres of the Adriatic Coast. Nowadays, Torre Pedrera is the ideal holiday destination for families with children. 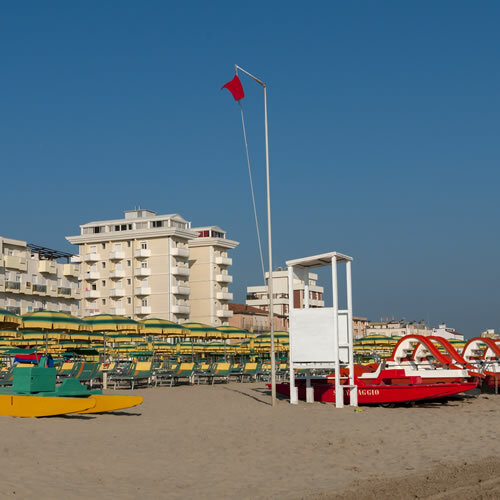 One of the most appreciated resorts of the Riviera Romagnola, it offers those looking for pleasant seaside holidays excellent tourist services, amazing fun opportunities, good cooking and the traditional warm hospitality from Romagna. Torre Pedrera is a thriving seaside resort which offers those interested in staying at a Hotel in Torre Pedrera the possibility to spend pleasant holidays here at reasonable prices. Relax and fun merge in pleasant harmony just in the heart of this charming resort where the liveliness of the sea front is dramatically offset by the peaceful landscapes of the surrounding countryside. Torre Pedrera boasts a 2000-metre-long beach of golden sand which is divided into 20 bathing establishments. Operated by skilled "bathing attendants", they are the pivotal point of the vast coastline and provide every comfort, such as comfortable bathing huts, hot and cold showers, toilets, children's playgrounds and absorbing entertainemnt activities. Not to be missed are the modern sports facilities it hosts: the Municipal Sports Centre gathers well-equipped tennis courts, skating rinks and football pitches. The sport offer is complemented by a Sailing Club, a Swimming School and a Surfing Centre. Hotels in Torre Pedrera are situated just in front of its compelling beach of golden sand, which extends for over 2000 metres. The vast coastline of Torre Pedrera gathers plenty of equipped sports facilities and is characterized by utmost hospitality: "In Torre Pedrera tourists soon turn into friends". The Tower of Torre Pedrera is the ancient building which was commissioned by the Pope and gave the village its name.